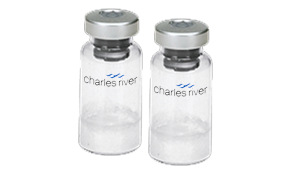 Charles River offers a comprehensive portfolio of antisera and antigen reagents, which are available in liquid and lyophilized aliquots for most common poultry pathogens. Biological preparations of common poultry pathogens prepared in specific pathogen-free (SPF) premium eggs, cell cultures or artificial media are available in a variety of forms, such as tissue homogenates, concentrates and allantoic fluid. All reagents are tested for potency, verified for specificity and can be used for applications such as agar gel immunodiffusion, HI, VN, SN and many others. Monospecific polyclonal antisera are produced in our CAV-negative SPF chickens. The birds used in the production of antiserum are housed in filtered-air positive-pressure (FAPP) barrier facilities. The birds are monitored to optimize antibody levels and to ensure the best product possible. Our standardized antisera are produced to obtain high levels of neutralizing activity, but also have been used for other laboratory applications, such as immunodiffusion, hemagglutination inhibition (HI) and immunoblotting. More than 40 tests are performed on each antiserum, and a quality control sheet is provided that confirms specificity.